Paris is one of those cities that keeps drawing one back, time and again. In September last year we were able to spend a week in this wonderful city, based in an apartment on Montmartre. It was our fourth and longest visit. Previous visits over a period of forty years were for just a few days. 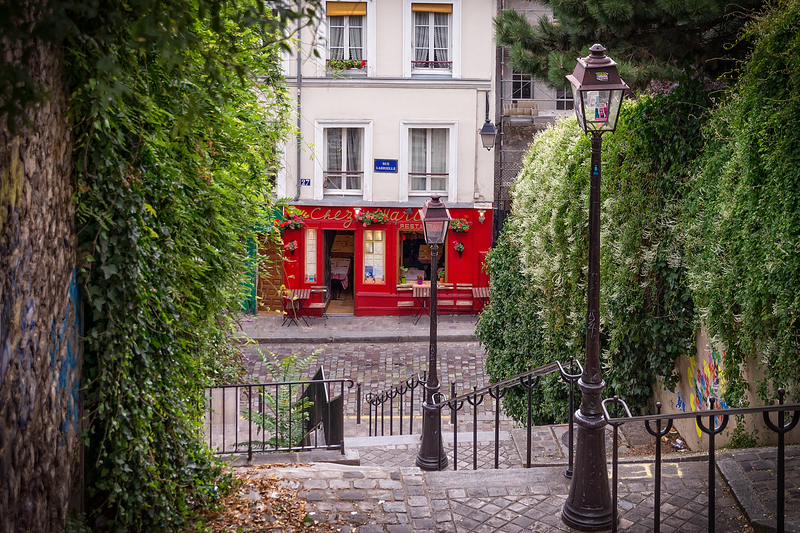 Early morning and late evening strolls took us through the narrow twisting streets, lanes and steps for which the Montmartre district is famous. This image is one of my favourites from the many photographs taken during the week. The day was overcast and cool, not the best for capturing sparking photos. After a memorable lunch in the Place du Tertre we found these steps at the southwestern corner of the square, leading to Rue Gabrielle and Restaurant Chez Marie. For me the view is quintessentially Paris. A large canvas print of this image now hangs in our kitchen – maybe we should call our kitchen Chez Marie! This entry was posted on February 3, 2014 by alphathread. It was filed under Chris Gregory, Exploration, France, Paris, Travel and was tagged with Chez Marie, Chez Marie Restaurant, Montmartre, Place du Tertre, Rue du Calvaire, steps. What a great photo! I can see why this is one of your favorite images.